Here is another good game, this one is " Hostages "
It's only the 64k version so don't believe the " Menu Map " Button you have to redefine at the start does anything as that is for the 128k version. I've included a poked version which makes you " Invincible and gives you Infinite Time. " Somewhere her can pass heroquest return of the wich lord and make a snapshot where it go to load the last tape block.?. Or knows sometipe of poke to pass levels rapdly. Or have pass the game in tape and know if it have true finish? This will be my last commit for a long time as my daughter is coming in the next days. ohhh, See if I can register on the wiki and no fuss brown. 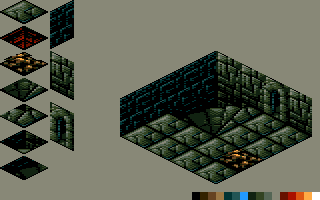 I working in a extrange experiment Heroquest port from tape with 4096 palette+ hardware sprites. At finish the original sure is looking best wtf as i not know how draw sprites . OK, no problem @remax , thanks for letting us know and uploading the games. I see you changed " The Way Of The Exploding Fist " and " The Way Of The Exploding Fist+ " that I uploaded to the wiki page into one download, that's fine, but they are separate games. The + version is a hack of sorts with different backgrounds, not a plus conversion with the Plus Palette, it does include a different set of colours for the title screen, but this works on the normal cpc. Well yes, but I was talking about the new episodes! After 42.bin file,(record wtf) in a Dans une sorte de miracle. Urusergui and me made the miracle of incorpored the face of the lord brujo displayed in upper part of the screen of the 128k version in the gx4000.. I still do not think it worked so well the first time. Only coping first 15 lines of the screen directly manually in cpc video ram.And the rest of image with a little algoritm i made that filters all 00 and f0 from a file copy( to no overwrite ingame screen and marcador screen). of the 128k game buffer video game ram. Injecting it in the 64k tape port buffer video ram &9400+ videogame. Every time the game call to my subroutines to changue the cpc normal palette to use the plus 4096 palette ingame and activate pac-man hardware sprites. Im not sure if at the finish it looking good, but anyway i designed the conversion in a dual-mode support. So when cartridge is executed gx4000 ask you to choose execute the original cpc tape port in old blue fashion. Or execute the alternative version with plus palette, hardware sprites to decorate the down part of the screen,lord face in the upper part as 128k. The game will be included the normal heroquest + the expansion return of the witch lord. It also implements a system so when you play the normal heroquest, and then you load return of the witch lord. The game trasspass the arms treasures,armor, and money you have recollected in the first part. But if you die latter you lost it . In principe,only made hardware sprites decorations is left to made, it not have sound as i not know how made sounds. 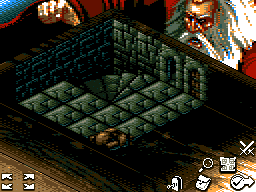 I also work on a CPC+ version of heroquest. Mine will be in mode 0 as you can see on the screenshot. There is still much work it. The colors remind me of Gods on Amiga/ST/PC. Also, being the CPC+/GX4000, you could still render the players using hardware sprites on mode 1. Instead of made trashy lyrics lettlers . Open cartucho.asm in winape assemble editor. ;registros colores de (6400-601f), 1 color de los 16 son 12 bits.primer byte (d3-d0)verde.d7-d4 rojo,y el otro byte (d3-do)-azul. Each ink of the game have two hex numbers in the first number first byte is red,second blue. In the second number, first byte is nothing, second green. Red+blue+green(rgb)=color of these ink in the 4096 palette. game have four inks. after change it with winape paused and memory write select go to winape menu and press assemble (ctrl+f9). select in the memory of cpc from &c000 to &ffff righ click and then save "heroquestcartucho.bin" witouth "". Execute heroquestcompile.bat simple press space or other button until it finish. Then go open *.cpr and you can view youn new combination of colours in the plus part . begining in line 1320 each sprite have a x coordinate and y cordinate, so you can put it anywhere in the screen. The data of hardware sprites are located in 1612 all are in file . Programs such retro game assets studio can generate it automatically. Then is the same compile it in the same form. I not recommend modify other thing if you not know what are you doing, problaby the result is heroquest fail to boot XD,pure experience. Thats all,enjoy the heroquest fallout 3030 with green radiocative. (ink suggestions are welcome). Mine is also a patching of the existing game !!! So you can !!! Here is an exclusive preview of what the game is. I move icons and there will be hard sprite. amazing gob. ¿You are porting the 128k version?. You can make it work in 64k? You disassembly all code?. this is a lot a lot of work . You are making it from cero without no&scart in the midde?. If you make this Hero Quest happen, it will be amazing! Is that the good old CPC!?! Looks awesome! Really looking forward. BTW: Please go for 128 KB or more. This got me thinking, because @dragon sorted out the game so that joypad button 2 would replace the space bar to let you swop from kicks to punches and back again. I didn't look at changing the controls as dragon had made the game playable for us, I just sorted out the infinite lives and changed the game back to normal. This was one of the very first games to get ported to the GX4000 over a year ago, it's on page two of this very long thread. Anyway, because @mr_lou asked for the disk, it made me check out the game again on the GX4000, I've learnt a couple of things over the past year so thought I'd see if I could improve the GX4000 version. I'm happy to say that I've done a new cart with a couple of improvements.
" Kung Fu Master "
The game now has a working Trainer, it stops on the title screen, pass with joypad one or space bar on the plus. The game is now Joypad Control only! Use the Console Pause Button to Quit the game. A little update to heroquest, fixed mind points not displayed(thanks urusergui to fix the draw). And working with hardware sprites in the upper part. Oh wow, this looks really great... hope you finish it!!! So we have two Heroquest updated being prepared? That's unbelievable. Amazingly I was talking about Heroquest to a colleague just yesterday! Can't wait to see this one, too!!! I really appreciate the trouble you've gone into with updating the list. If there's nobody else ready to pick up the wiki page, I'll start doing it myself, just le me know guys! I think they are two different versions. The heroquest is wortking GOB, i think maybe is only to 128k. Because the music subrutine, is a interruption in &0058 thats call to bank c7 in in &4006. He writes continusly in &4000-7fff zone , so this make rom cartridge incompatible. Until you reroute all rams access ^^. A big big big work is neccesary follow all sound subrutine, and you need free memory in the stardard 64k. The mine is the version of the poor 64k for gx4000 and 464+ it lost sound, but atleast it works . Is Ok for me if you want take the releve in the wiki. I've just done a new version of " Kung-Fu Master "
I've added a secret version that gives Infinite energy. The game can be tricky even with the infinite lives trainer ( that level 5 boss is a pain ). 128K version. Try to make it work on 64k but i think it will be difficult... So i think 6128+ only on cardtridge. I don't use no&scart. I disassemble all code; change routines with mine; move gfx on cardtridge gradually etc etc. Hard sprite are used for mouse cursor and game icones. Page created in 0.418 seconds with 105 queries.